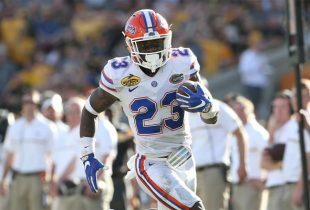 With the Florida Gators’ first Junior Day of the 2011 session in the books and recruiting for the next term already underway, OGGOA recruiting contributor Zach Abolverdi takes a look at what will be the top five needs for the team next offseason. Check out the Gators’ top five positions of need for 2011 after the jump! Despite bringing in one of the most talented defensive line groups in the history of college football recruiting, the position is a top priority for the Gators in 2011. UF loses five defensive ends and tackles in 2010, putting a solid dent into the depth and experience of the line. Additionally, the attrition of Gary Brown and Edwin Herbert makes adding tackles even more crucial for defensive line coach Dan McCarney. Luckily for them, the top DT in the nation lives forty minutes away from campus. Tim Jernigan (Lake City, FL), a die-hard Florida fan, has had the Gators as the leader from the beginning of his recruitment and is an absolute must-get for McCarney. At DE, the pool of prospects is so impressive that the Gators should have no problem fulfilling their needs. Not only are they in good shape with in-state players, UF also has a legitimate shot at arguably the top end in the nation in Jadeveon Clowney (Rock Hill, SC). South Carolina and Florida are in front, but Clowney’s father is a Gators fan, and head coach Urban Meyer will be personally recruiting this relentless pass rusher. After next season, Florida will lose three starters and a very experienced back-up in Hurt; fortunately, the staff did a good job of adding depth to the line in 2009 and bringing in two four-star tackles in Chaz Green and Ian Silberman in 2010. The OL prospects are relatively weak compared to last year, particularly in the state of Florida. However, offensive coordinator and offensive line coach Steve Addazio has a chance to reel in some good ones. Christian Westerman (Chandler, AZ), the second rated offensive tackle according to Scout.com, has been high on the Gators all along and actually has a family tie to the university (his grandmother graduated from UF). Addazio just recently offered a scholarship to guard Angelo Mangiro (Succasunna, NJ), and the accomplishments of the coaching staff and the program are positives for him. Even with these three graduating, the linebacker position is a necessity not because of who is coming out but more because of who has not come in. Although the coaching staff brought in a few athletic linebackers in 2010, they failed to sign a highly touted playmaker at the position. They will have that chance this year amid the abundance of talent in the Southeast region of the country. All the discussion at linebacker starts and ends with James Wilder, Jr. (Tampa, FL), the “Ronald Powell of 2011” because of his athleticism and versatility. Wilder favors Florida if he decides to play defense in college (where the majority of analysts feel he has the most potential), but the staff has offered him a scholarship as an athlete due to his offensive ambitions. Another player with a great skill set is inside linebacker, James Vaughters (Tucker, GA), has visited UF several times and would be a great grab for the Gators. Now that Dee Finley has moved to linebacker, if four-star Jonathan Dowling ends up at wide receiver, there could be real problem at safety. The Gators would only have Matt Elam, Josh Evans and Jordan Haden on scholarship after the 2010 season (assuming Hill goes pro), and two would be coming off their freshman season. Therefore, this is another critical position for Florida, but defensive coordinator and cornerbacks coach Teryl Austin and co-defensive coordinator and safeties coach Chuck Heater have the ability to overcome any holes. Junior Day attendee Brian Randolph (Marietta, GA) has great size and speed and named the Gators his leader following the visit. Two more prospects, Ha’Sean Clinton-Dix (Orlando, FL) and Wayne Lyons (Fort Lauderdale, FL), are both Florida fans and have UF towards the top of their respective lists. Like the linebacker position, UF didn’t sign a big-time QB in 2010. Part of that was due to the lack of quality quarterbacks, but that is not the case in 2011. There are plenty of prospects that quarterbacks coach Scot Loeffler can pursue who are capable of running Meyer’s spread offense. Jeff Driskel (Oviedo, FL) may be The Gators’ top target at the position, especially after he completed several standout performances in combines over the last few months. Christian Lemay (Matthews, NC), another top-tier passer, has a history with UF began that his father filling the role of team chaplain before his family moved to North Carolina in 2006. There is no doubt that Lemay will be one of the highest priorities for the staff this year. Never too early to talk about 2011. Thanks for the great summary. Love the recruiting info…great job guys! What a great recruiting update! James Wilder Jr…I don’t care if he wants to play center! Or if he wants to be the wildcat QB. This guy would be the crown jewel of this class! James Vaughters makes Jeff Luc look silly. Just watch his video from last year, it is jaw dropping. This has got to be a Urban priority recruit just like Mack Brown was out of Georgia. With Gary Brown gone, Tim Jernagin is a must get. He will fit right in with the incredible talent that was brought in this year. Also, that big freakish WR out of Belle Glade.